I tend to hear people say they need a brownie/drink/massage when they’ve have a rough day – and there’s definitely something to be said for indulging in a favorite treat when you’re feeling down. 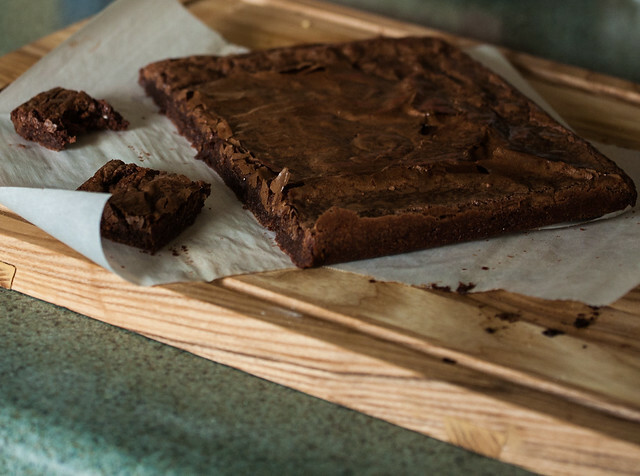 But today has been pretty good, and I made a pan of brownies to celebrate. It’s my Friday today, the sun peeked out from behind the clouds, I found a lovely little bloom on my peach tree, and why not add some chocolate to make it just that much better? Mmmm good! I want of these, Em! I’ll swap you a jar of homemade salsa for a brownie! Deal! Sounds like a fair trade to me!